For the past year, I’ve watched great women in our community grow in the SEO industry. When I started the TOPS SEO women series, it got mixed reviews. Some welcomed the series and embraced it, while others in the community at large weren’t crazy about it, and said so. Of course, like anything in life and community, not everyone is going to like what you do. But in the spirit of celebration and creating the conversation, I was thrilled and took advantage of meeting some amazing, smart women. Unfortunately, we appear to have had some deliberate manipulation of the voting and even after numerous attempts to reach people, with no response, I had to make a tough call. I decided that in order to be fair to the rest of the entries, I would simply remove those that seem to have been gamed. I met women that loved to geek on Google Analytics, are miracle workers in Excel or were progressive in their approach to link building. I’m very grateful to the women who took time to nominate the twenty eight women nominees and for the women and men that voted. All in all it’s been a wonderful experience, and with the conversation that ensued from the original article, I wanted to offer more than just a poll with numbers. The fact that they were mothers, speakers, and mentors was no surprise. In many ways, I wanted to introduce SEO women globally to each other. To create a network of like minded women that could relate to each other. Not because we are women, but because it wasn’t the norm within the SEO industry for women to talk about themselves. I invited all the women who were nominated to answer a few questions that would interest our readers. I was hoping to get everyone to participate, however, only 50% of the women shared their stories with us. But, that’s more than what we started with, and that’s a good thing. A few women I knew and personally followed prior to featuring them on the Top SEO Women series included Dana Lookadoo, whom I’ve met and have had the pleasure of watching shine through our industry. Then there was Debra Mastaler, who never disappoints and is always ready to help when she can. Bonnie Burns, as always, came through with her great personality, and years of no-nonsense style. What was really interesting to read were women like Monica Wright explaining how to say (Say it! Noth shoah! ), Melissa Fach sharing her side note “I do call myself ‘an idea girl’” or Joe Turbull, who spearheaded Search London. I could go on and on, but you can take a look through our blog (search for Meet) and find all of them listed there. What was interesting however, was their personal stories, more than their careers. As a matter of fact, I’ve encouraged input from global women in Europe, Asia, South America, Canada and Australia, to name a few corners of the world. 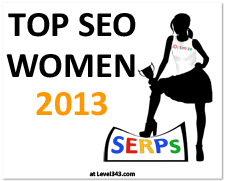 I want to again thank all the women who participated and helped make this past Top SEO Women a success. In conclusion, as a world traveler, finding out and reading about another woman on the other side of world is exciting. If only for one moment to stop and be thankful for what you have, (cuz it’s an awesome deal) or rejoice and enjoy what they have (cuz it’s an awesome deal). You know – the good, bad and ugly of letting our hair down. Building the community if you will… the fact she works in the SEO industry is really secondary, after all – it’s just a job. Thanks for all your wonderful support, ladies.